Gen. Muhammadu Buhari (retd) of the All Progressives Congress, APC defeated the incumbent president, Goodluck Jonathan of the Peoples Democratic Party, PDP to emerge the president-elect of Nigeria. Buhari won Nigeria’s presidential election by 2.57 million votes, according to official results announced on Wednesday. The 72-year-old won 15,424,921 votes or 53.95 percent of the 28,587,564 total valid votes cast. His nearest rival, President Goodluck Jonathan, 57, won 12,853,162 (44.96 percent) at the election, which was held on Saturday and Sunday. 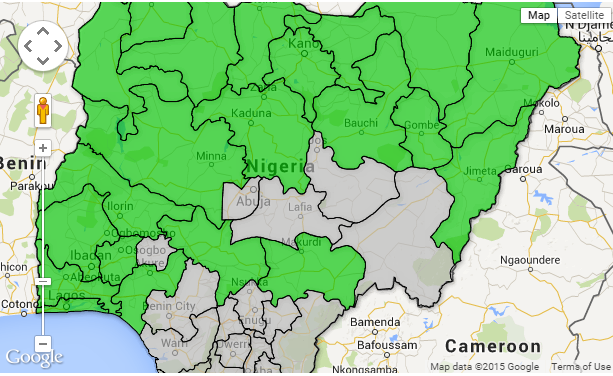 Note: The Green colour represents states won by Buhari while the Grey represents states won by Jonathan.